Latin Quarter: I think that this map favors Zerg in both matchups because the rush distances are long and the distance from the main to the third is long. One solution might be to make the third area smaller. Idun: It's hard to get a feel for this kind of map without playing it many times. The zergling-only entrance is certainly an advantage, but it's difficult for Zerg to take extra bases later. This seems to make it unfavorable for Zerg. Toad Stone: This map plays a bit like Latin Quarter. With more bases, Protoss and Terran should do better against Zerg on Toad Stone than they do on Latin Quarter. 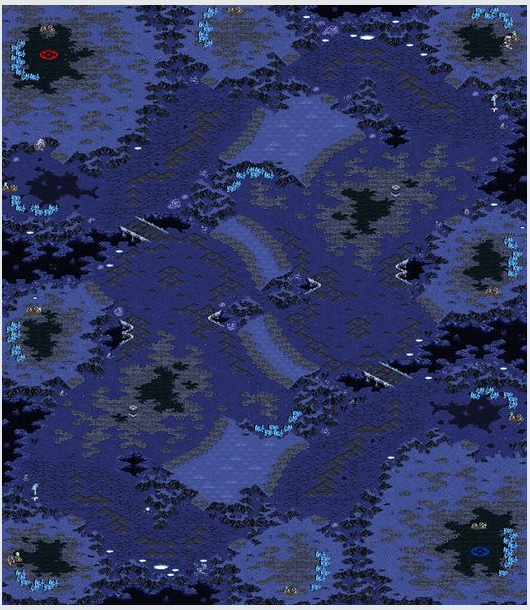 I think that this map slightly favors Zerg. Latin Quarter: The fact that there are many paths for movement on Latin Quarter is a bit annoying for Terran. However, it seems to be okay overall. I initially thought that the third was easy to take, but it was further than I thought it would be once I accounted for the length of the high ground at the third (interpretation: He's talking about the distance from the main to the actual mining area of the third. The distance to the third's entrance is short). It would be nice to make that a bit shorter. Idun is a concept map, so it is difficult to know from one game. However, I definitely think that the zergling-only path to the center should be blocked. That seems like a mistake. Toad Stone seems like the most standard map. It's a minor thing, but I liked that stones were used to mark the placement of command centers. I think that TvP would be good on this map: It's a four-player map, taking the third is easy, and the fourth base is fairly close as well. TvZ seems like it would be fairly standard as well. I personally thought that this was the best map of the three. Latin Quarter: It seems pretty standard...but I honestly cannot seem to remember anything about this map. Idun: The zergling-only entrance lets Zerg take the natural without worries, but other races have to prepare against early zergling use. On the other hand, it seems a bit too good for Protoss in the late game. Toad Stone: Very standard map. As a Protoss, I liked the fact that pylon sim city works well on this map. Also, the unbuildable center/ridge tiles seem to be good for preventing overly long and tiring games. Man vs Machine TeamLeague (D/C rank) is using Latin Quarter in the map pool. Replays of Tour #1 can be downloaded from the following link. 5 games were played on Overwatch and 1 on Roadkill (scroll down). Other maps have had name changes. See forum post in link below for details.